See below for screenshot and the descriptions of these options. Relative + value will add the value of a setting in the preset to the current value of the photo. Relative + percentage interprets the value of the setting in the preset as a percentage to be added to the current value of the photo. Will apply the preset as Lightroom does, overwriting the current photos settings with the preset settings. All settings in the preset will be multiplied with this factor, regardless the mode it operates in. This option allows you to apply a preset stronger of softer. 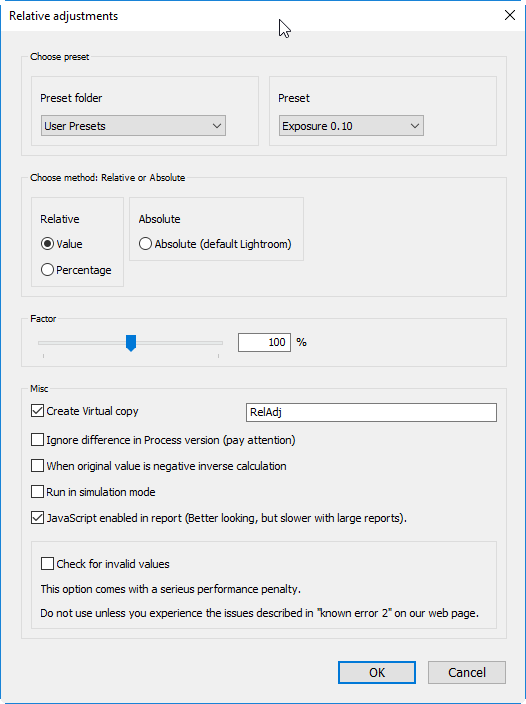 Choosing this option determines whether the changed settings are applied to the selected photo(s) or if they are applied on a Virtual copy created beforehand. This text is added as the copy name in Lightroom, see your meta data. Choosing this option will make the plug-in perform all the calculations and list these to the output, yet does NOT apply these settings to the photo. So the photos keeps untouched. 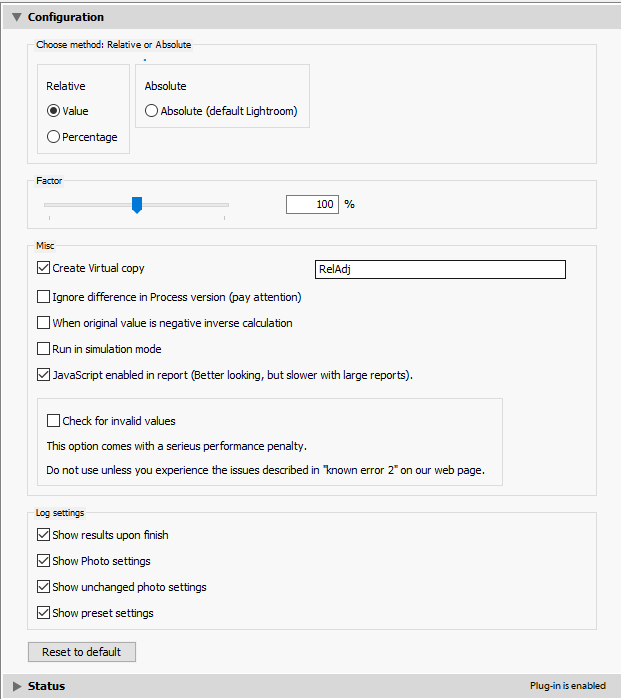 This option allows you to inspect the consequences of applying a preset without changing the photo(s). Inverse calculation when original value is negative. To clarify this feature see table below. All calculations are written to a local web page that can be read in any browser. This section determines the behavior the what is written to the log file and if it should automatically should be opened after the plug-in finishes. If set, the plug-in will open your default browser with the log file after the plug-in has finished. Default all photos settings are written to the log file. Unchecking this option will hide all photo settings that have not been changed by the plug-in, which makes the log compacter. Default a listing of the preset settings is written at the start of the log file. Uncheck this option if you do not want the listing of the preset chosen. Check all the Views that work properly when creating a Virtual copy!